I read the late Sir Terry Pratchett’s The Truth in his Discworld series. This was just before he left us, which makes it a bit bittersweet. Discworld is one of the most amazing series out there, as far as I’m concerned, and it’s in the top twenty sellers in the world. It’s a satiric alternate world fantasy series of linked novels that spins satire both precise and broad, and always on point. The Truth manages to be relevant to the time and tech of when it was written, of the past back when Pratchett started as a journalist, and deeply relevant now, tackling the psychological concept of newspapers and the power of news. Pratchett makes good use of old characters and the new ones in the story are delightful. Pratchett’s writing is so amazingly constructed. It’s like an onion, it has layers. This is probably one of my favorites now of the vast series for its balance of slapstick humor with razor social commentary. 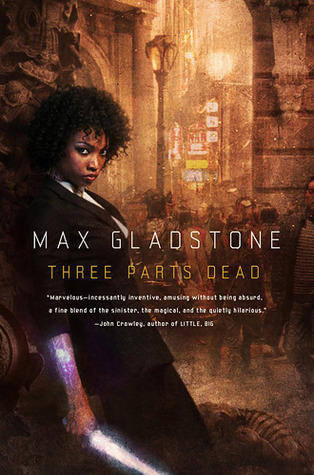 I also read Max Gladstone’s Three Parts Dead, the first in his Craft Sequence series that got so much buzz. And it was deserved buzz, for me. It’s a secondary world fantasy with many different elements and cultural bits packed into the text (and a very subtle strain of dark satire as well.) In Gladstone’s mix of modern and archaic world-building, gods exist and power cities, magicians have abandoned the gods for a different type of magic that involves the legal courts, and everything is for hire, including vampire ship captains and necromancy. This book centers on Tara, a scrappy junior associate necromancer brought in to help resurrect into a new form a dead fire god, and Abelard, a junior priest of the fire god, who becomes Tara’s detecting partner when they discover the god has been murdered and a bigger conspiracy seems to be unfolding. One part legal thriller, one part action spy mission, and one part wondrous fantasy, it’s a nice launch. Gladstone’s subsequent books in the series reuse some characters but follow different wizards in different parts of his very complex world. In case you didn’t get to see it/knew about it on the Internet, here’s the preview teaser and then whole video documentary of Game of Thrones, the musical, for fund-raising for the Red Nose Day campaign. I imagine views still help them out with revenue from YouTube and such, and believe me, it’s worth seeing. No, Fantasy Fiction is Not Being Destroyed by Mega Multi-Volume Series. Or Deadly Octopi. Yes, I’m alive, shut up. Recently, folks on SFFWorld.com brought to my attention a new column in The Guardian newspaper by Damien Walter on the current tyranny of the mega sized, multi-volume series in fantasy fiction. I.E. Game of Thrones is ruining everything! And sidelining anything that isn’t a mega-sized, multi-volume fantasy series in book publishing. Because fiction publishing is run by underwear gnomes apparently. I like Walter, I do, but this article (and to a lesser degree, an official counter “response” composed by new author Natasha Pulley, which was equally tone deaf about the actual fantasy field,) is an excellent example of why more people don’t find and read good books — because writers like Walter tell them that the field is overrun with whatever has been designated the current trendy “problem” that is killing everything off, so why bother. If the media would stop sounding death dirges as the only thing that ever interests them about fictional works, we’d have twice as many fiction readers, rather than a population that is continually taught that they’ll hate most fiction out there. Nothing ever kills anything off in fiction publishing. (Or for that matter, in most forms of art.) Popularity is not a death sentence for everything else and one thing being popular doesn’t mean that other, different things are not equally or more popular. Also, authors are not herded by publishers like camels. Anyone who has worked with authors know that they are worse than cats. It’s not a very accurate reading of the fantasy market. Which given that it’s coming from Damien Walter, who should know better, is annoying. Mega-sized, multi-volume series are almost entirely the domain of alternate world “epic” fantasy. Because they are epics, which is supposed to be a sweeping, big story by definition. 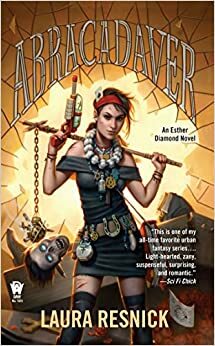 Other alternate world novels are shorter, serial series or stand alones like Katherine Addison’s award-nominated Goblin Emperor, which barely qualifies as mega-long, if that. Contemporary fantasy uses long running series that are on average not mega in size, like mystery series, as well as various stand alones. Only once in a while does it do mega sized series books. Historical fantasy also does stand alones, shorter serial series and occasionally mega-sized multi-volumes. Comic fantasy does either shorter serial series or stand alones. Dark fantasy and horror are usually stand alones, although if it’s a dark fantasy involving a multiverse or alternate world, it might be a mega series. Some horror novels that are standalones are very thick, but that’s just one book. Multiverse usually involves a series, but often not very large ones. Futuristic fantasy can be large, either as a series or standalones, but is not routinely so, being mostly serial series and trilogies. YA fantasy contains all the various sub-settings of fantasy. They have few stand alones in fantasy — they tend to all be series. They range from fairly short, and usually contemporary set serial series to larger epic alternate world series. But because the contemporary fantasy setting is more popular in YA than the alternate world settings, YA tends to average on the shorter side. Some of its most popular series, Eragon, Harry Potter, Percy Jackson, are thick epic series, but many others are not. Fantasy published in general fiction tends to be stand alones and may be long or short, depending on what it is. For instance, Touch by Claire North, put out by Redhook, a general fiction arm of Hatchette, is a medium sized standalone dark fantasy thriller. So basically “fantasy” authors don’t have to move away from mega multi-volume series because not all of them are doing mega multi-volume series. In fact, it’s rare that an author manages to do one past three books. The ones who publish in alternate world fantasy have routinely experimented with different forms — one long series like Song of Ice and Fire, multiple shorter trilogy series in the same universe or a mix of stand alones and trilogies in the same universe like Joe Abercrombie does, shorter serial mystery-like series like Alex Bledsoe’s Eddie LaCrosse series, multiple trilogy series with different publishers, large duologies, stand alones, etc. David Gemmell, who wrote a lot of historical fantasy, as well as alternate world fantasy, did everything from stand alones to his 9 volume Drenai series. But that’s inconvenient for the hook. The hook is that because Game of Thrones, five years in, is still a very popular t.v. show, and based on a nearly twenty-year-old series written by an author who was already a bestseller when he started it, (and from whom his publisher originally wanted only four books,) that clearly this is only now warping the entire field of fantasy fiction because some other lower rung bestseller guy got a book deal for a new trilogy. Because the fiction market is symbiotic and so publishers slap that it’s like George Martin on anything epic fantasy, they must be hounding authors for only that as the only thing in fantasy that is selling or getting made into a t.v. show. (Pay no attention to Vampire Diaries, or Bitten, The Leftovers, Jonathan Strange & Mr. Norrell, Outlander, etc.) Because only one thing in any field can be popular at a time and it wipes out everything else, really it does. So anything else is “sidelined” right now because also a nearly thirty-year-old epic fantasy series that was supposed to be seven books in the nineties ended up being fifteen books that took more time and lost its author. And because a twenty-five-year-old epic fantasy series briefly had a t.v. series that flopped several years ago. Because trilogies! That they’ve been doing since the seventies. And which consist of three books, technically multi-volume but please. The reality is that the contemporary fantasy bestsellers, like Kelley Armstrong’s shared universe series, some of which were adapted for t.v. 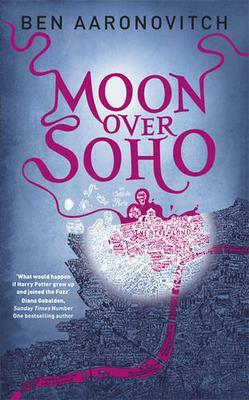 show Bitten, routinely outsell most alternate world fantasy fiction, as does for that matter bestselling fantasy romance, most of which is contemporary set. And that setting also means they have better odds for being turned into a t.v. series or a movie, especially if it’s YA. Ben Aaronovich’s Rivers of London series is coming to British t.v. and Daniel Jose Older’s new series Bone Street Rumba just got optioned. That’s hardly sidelined. Kazuo Ishiguro’s The Buried Giant isn’t sidelined. Neil Gaiman’s latest bestselling short story collection is not sidelined. 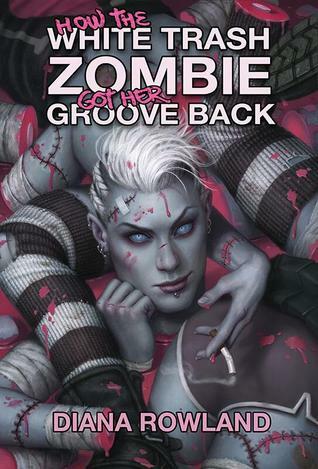 Jim Butcher and Patricia Briggs aren’t sidelined (and Butcher had a short-lived t.v. series that did establish a cult following before being axed.) Lauren Beukes’ bestselling stand alone The Shining Girls did just fine. And the late Sir Terry Pratchett is still kicking most authors’ asses in sales. *The response by author Natasha Pulley that asserts writing short fantasy fiction is hard is equally silly, given that fantasy authors have been doing it for over a hundred years. And that her up-coming debut historical fantasy novel, The Watchmaker of Filigree, is only 336 pages long. But we won’t hold it against her or Walter on the fiction side. If we had to reject authors for all the silly things they say about the market, we would have little to read. My pal Sue is having her first novel debut this year from British publisher Tickety Boo Press and it’s a pip. Oracle is a secondary world gaslight fantasy, chock full with train crashes, riots, politics and magic both poignant and malicious. It’s a world undergoing radical social change as it becomes industrialized, a world in which wandering mad prophets are made with magic out of those who have died. I interviewed Sue about her new work and her future plans for SFFWorld.com. You can check out the link here below, and the book is available as an e-book internationally, and a print book in British bookstores, Amazon U.K. and from Tickety Boo directly, including international shipping. Sue has been publishing short fiction and has had a devout quiet cult following for some time. I’m delighted her work is now being made available to a larger audience, and in such a fun and imaginative novel as Oracle. So it’s been a bit hectic. The Hugo Awards drama I’ve commented some on at Whatever and SFFWorld, and then had to re-think some of it as weirder and weirder information keeps coming into it. So I’ll probably post some links to articles about it in the Social Equality section by others, but otherwise, I’m moving on. When things get more equal in society, there will be this sort of blow-up reaction from some. Also missed, a prestigious bio pic, Suffragette, about the women’s suffrage movement in the U.S., and a thriller based on the novel by Laura Lippman called Every Secret Thing, starring Diane Lane, Elizabeth Banks and Dakota Fanning. The first, sleepier part of 2015 had a hit with spunky version Cinderella (not unexpected,) with $494+ million box office so far, the animated Home with $326+ million, and Insurgent, #2 in the Divergent franchise, taking in over $272 million. Not a bad start, and women have been helping the more ensemble giant action pictures too, such as Furious 7 and Avengers: Age of Ultron. Did I see any of those? Only Age of Ultron so far. I’ll probably see most of the others later. I’ll give an Avengers #2 review in a bit. Also, books! What? Stop laughing. Really, I’m going to talk about some books this week, I swear.